Cognac Vinegar for sale. Buy online at Zingerman's Mail Order. Gourmet Gifts. Food Gifts. 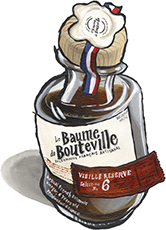 It’s not too often you see the French taking a page from the Italians when it comes to cuisine, but they did just that in crafting this intense, complex vinegar. It’s made from the same grapes (Trebbiano) balsamic vinegar makers use in Modena, Italy. Just like the Italians, they reduce the fresh pressed juice in copper kettles, then age the concentrated juice in oak barrels—in this case, ones formerly used to age Cognac, which gives it a French twist. Like its Italian cousin, this vinegar is smooth, complex, a little sweet with a finish that seems to linger for hours. Unlike its cousin, it’s light on the tongue (not thick and syrupy). Incredibly versatile in the kitchen. My favorite new vinegar in years.